"Dance Hall Green" Cissy was the souvenir piece for the 2004 MADCC Cissy event. 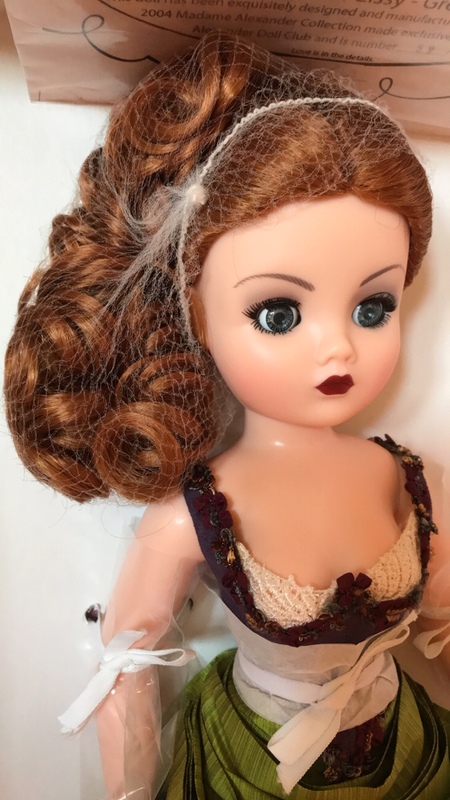 She has gorgeous tousled red curls and blue eyes. She was produced in several different costume colors including green, purple, blue and red. Aside from the draped waist sash, they were identical. 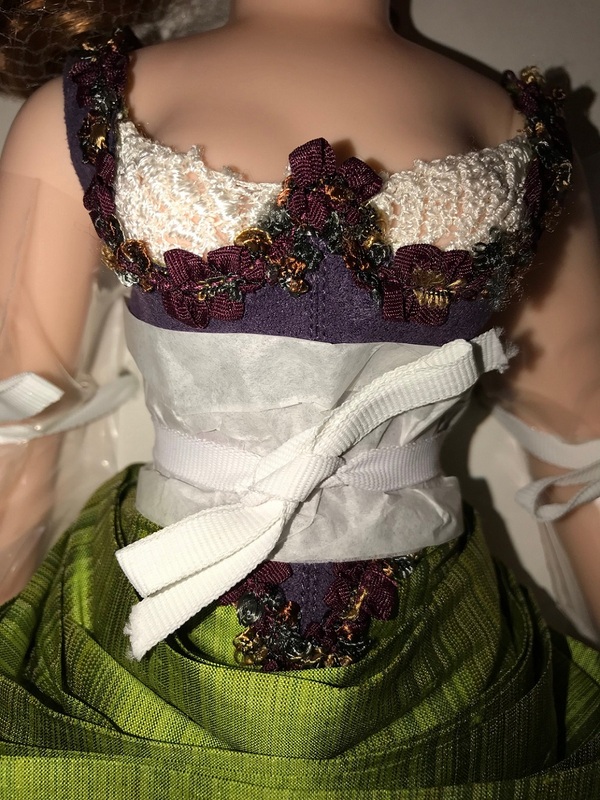 Our dance hall beauty is wearing a short purple taffeta dress edged with beautiful floral trim around the waist and neckline and pretty ivory lace insets on the bodice and green sash draped around her waist and falling in a train down both sides. 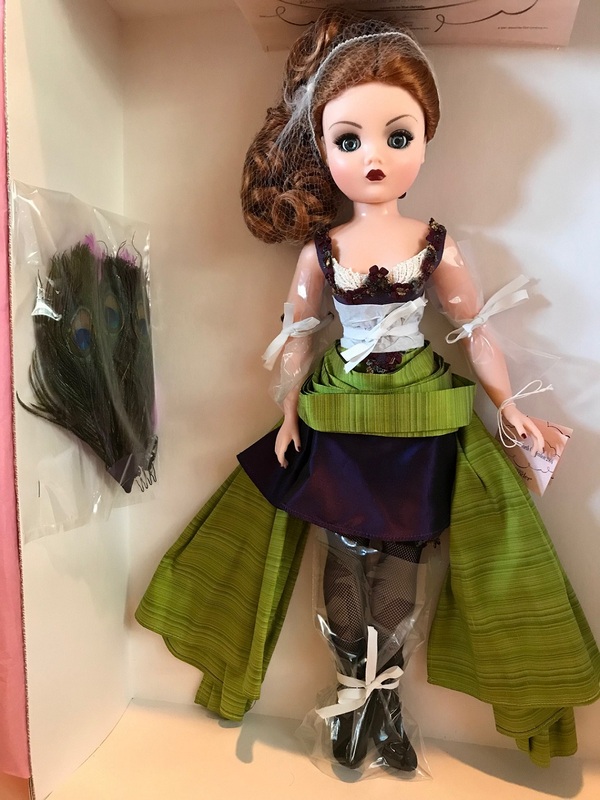 Her outfit also includes black fishnet tights; black heeled lace-up boots; a garter worn around her thigh that match the floral trim on her bodice; jeweled and peacock feather plumed headpiece and fan (still sealed in plastic and attached to side of box). Never displayed. PLEASE NOTE: The plumed headpiece (peacock feathers & marabou) has an attached comb so it stays put. The peacock fan has attached ties. The doll and costume are pristine with vibrant colors - I'm just not a good photographer.